1. Dense water is formed at the surface in small, highly localized regions of the ocean in polar seas. Thus the abyssal circulation seems to be induced by local sources, marked in Fig. 11.9. But for every particle of water that sinks, one must return to the surface. Property distributions reviewed in Section 11.2.1 suggest that the return branch does not occur in one, or a few, geographical locations. It seems reasonable to suppose, therefore, that there is widespread compensating upwelling on the scale of the basin, as sketched in our schematic diagram used to introduce this chapter, Fig. 11.1. 2. The deep flow is sluggish with very long timescales. It will therefore be in geostrophic, hydrostatic, and thermal wind balance. Moreover Eq. 10-12 will be appropriate, telling us that if columns of fluid are stretched or squashed then meridional motion results. FIGURE 11.15. Water is imagined to sink in a localized region in polar latitudes (the single long arrow pointing downward) with compensating upwelling distributed over the basin (the many short arrows pointing upward). Taylor columns in the interior are therefore stretched and move toward the pole, satisfying Eq. 11-8. 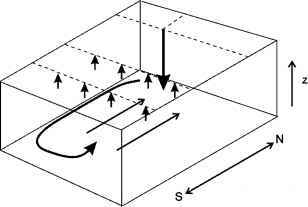 The poleward motion over the interior is balanced by equatorward flow in a western boundary current. bottom where we have set wbottom = 0 (assuming a flat bottom) and supposed wmid-depth > 0, directed upwards, as sketched in Figs. 11.1 and 11.15. Thus fluid columns must move poleward, towards the deep water mass source! We can interpret this result in terms of our discussion of T-P on the sphere in Chapter 10. There we found that Taylor columns in the thermocline of the subtropical gyres move equatorward to accommodate Ekman pumping driven from above by the curl of the wind stress. In the present context we deduce that abyssal columns in the interior of the ocean must move poleward in response to upwelling at mid-depth, compensating for polar sinking. Referring back to Fig. 10.15b and simply reversing the sign of the arrows, we see that by moving poleward, Taylor columns will stretch in a direction parallel to Q relative to the spherical, horizontal surfaces, producing the required upwelling. Henry Melson Stommel, 1920—1992, was the most influential dynamical oceanographer of all time. A theorist who made observations at sea and also worked in the laboratory, Stommel shaped the field and contributed many of the seminal ideas that led to the development of our understanding of the wind-driven (Chapter 10) and thermohaline circulation of the ocean (Chapter 11). Stommel joined the Woods Hole Oceanographic Institution (WHOI) in 1944 and left in 1959 to become a professor, first briefly at Harvard, then at MIT before returning to WHOI (his spiritual home) in 1979. FIGURE 11.16. 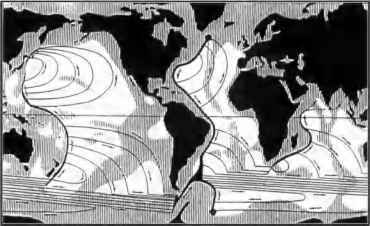 Schematic of the abyssal circulation in the ocean deduced by Stommel (1958) based on consideration of Eq. 10-12 and its vertical integral, Eq. 11-8. He imagined that the abyssal ocean was driven by sinking in two regions, the Labrador-Greenland Sea and the Weddell Sea, represented by the large black dots. Upwelling over the interior of the ocean led to interior poleward motion with return flows in western boundary currents. The shaded areas represent regions of elevated topography (cf. Fig. 9.1). shown in Fig. 11.16 driven by sinking in the northern North Atlantic and the Weddell Sea in Antarctica. Note that the interior flow is directed poleward everywhere in accord with Eq. 11-8. Fluid from the sinking regions is carried away in western boundary currents. Thus Stommel hypothesized the existence of a boundary current in the North Atlantic flowing southward at depth, beneath the Gulf Stream! As we shall discuss in Section 11.4, this was subsequently confirmed by direct observation. 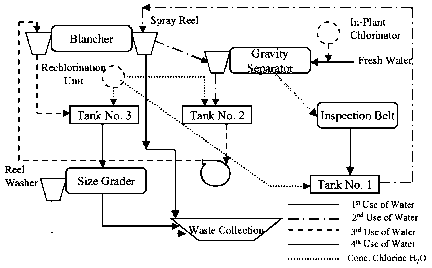 A laboratory experiment can be used to vividly illustrate the dynamical ideas that underpin the abyssal circulation schematic, Fig. 11.16, proposed by Stommel. It was first carried out in Woods Hole by Stommel and collaborators. 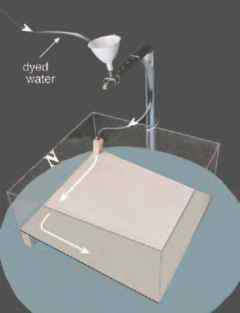 The apparatus is shown in Fig. 11.17 and described in the legend. We use the same tank as in the wind-driven circulation experiment (GFD Lab XIII, described in Section 10.2.4) with a sloping base to represent spherical effects, but without the rotating disc above. Dyed water is introduced very slowly, through a diffuser in the shallow end of the tank (representing polar latitudes). The surface of the water thus rises, stretching interior Taylor columns, which therefore move toward the shallow (poleward) end of the tank. Boundary currents develop on the poleward and western boundaries supplying fluid to the deep end (equatorward) of the tank, just as sketched in Fig. 11.15. FIGURE 11.17. Apparatus used to illustrate the driving of deep ocean circulation by localized sinking of fluid. A sloping base is used to represent the influence of sphericity on Taylor columns as in GFD XIII. The 50 cm square tank is filled with water and set rotating anticlockwise at a rate of Q = 5 rpm. (The sense of rotation is thus representative of the northern hemisphere). Dyed water, supplied via a funnel from an overhead bucket, flows slowly into the tank through a diffuser located in the ''northeast'' corner at a rate of typically 20 cm3 min"1 or so. The circulation of the dyed fluid is viewed from above using a camera.